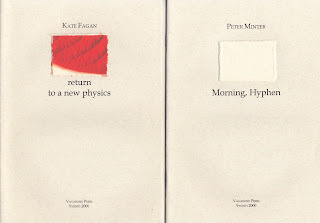 Kate Fagan's is a cleverly titled booklet - return to a new physics. Remember "the new physics" back in the early 1980's...parallel universes, The Dao of Physics, psychic energies scientifically proven and so on? Philip Mead recently described Peter's poetry as giving the reader an experience similar to using a play station...but I think the effect is less urgent, more lateral- more like playing the Macintosh CD-Rom games Myst or Riven. Peter's poems celebrate incongruities, well, really, they revel in incongruity...they are not linear, not rational - you should suspend your brain's insistent quest for meaning and surrender, give yourself over to these poems - each poem here is written in tercet stanzas followed by a short paragraph of poetic prose - so the structure is quite formal although Peter applies a principle of indeterminacy - so it all appears neat and tidy, contained, but when you enter the structure you enter the imaginative realm of wily language strategies - it, language, being an especially complicated transmitter of imagery, sense, & thought...in that sense, the experience is a bit like clicking around or through Riven. in the guise of miracles fallen. These poets are both engaged in language-play - language-art that anticipates, in poetic terms, the future or does it ? Only time will tell but, for the moment this play subverts and challenges old ossifications, chipping at them, breaking them down....and it's an enjoyable, stimulating reading experience...The paradox is that although this broken syntax and lateral placements represents the times - a digital age – you still only need a pencil and paper to make them. Kate Fagan and Peter Minter – congratulations ! To borrow a phrase from a launch long ago in the old analog millennium...."I now declare these booklets open !"